Home » Minutes Template UK? 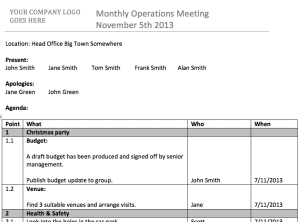 Integrated meeting minutes and agenda template. One of my most popular blogs last year was my UK Minutes Template. At the time I just wrote about a Minutes Template that I’ve used a lot over the years but I’ve got lots more examples that may be more appropriate to different styles of meeting. 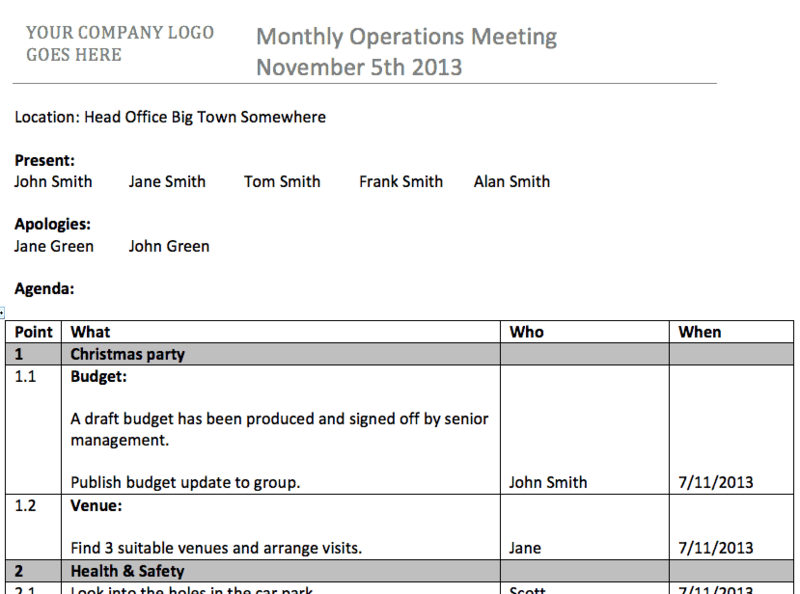 Over the coming weeks I plan to compile a few more example templates for meeting minutes and write a follow-up blog. I’d love to hear from you if you’ve got a great meeting minutes template that you’d like to share. I’m happy to edit any templates you send over to remove company details and make them generic. I’d also love to know what formats best suit people, I’m assuming Microsoft Word but may be people are increasingly using Apple Pages or Google Docs.